All the guests and host played with dry colours and flower petals on the open ground of Taj Land Ends, located in Bandra. 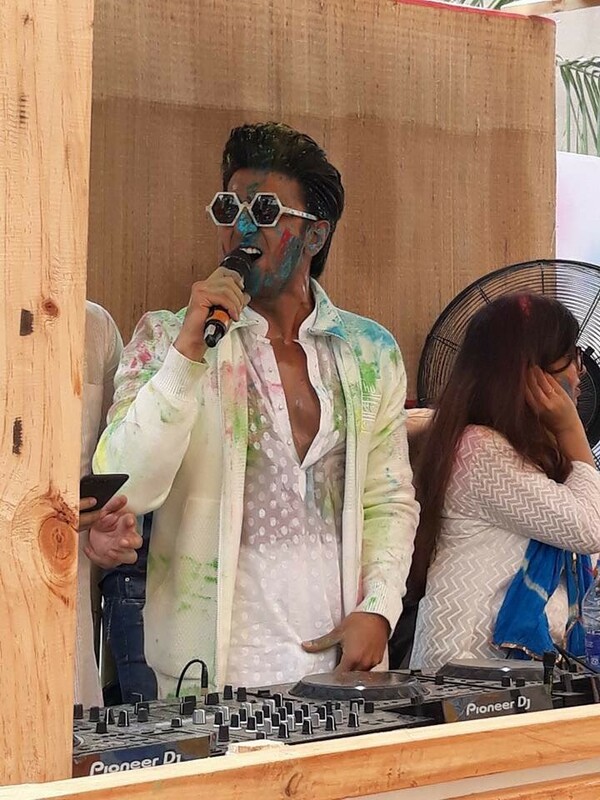 Iconic American rapper Pharrell Williams celebrates his first ever Holi, along with Bollywood superstar Ranveer Singh on Friday in Mumbai. The party was organised by the sportswear company Adidas, whereas Pharrell visited the city to unveil the Adidas Originals this Holi' collection special range of powder-dyed apparel and sneakers in pastel shades. Many pretty faces like video jokey Anusha Dandekar, Celebrity chef Sarah Todd, Mini Mathur along with her two kids among others were present at the party. Dressed in the white kurta and animal printed pants and white sports shoes, the 11 times Grammy Awards winner Pharrell seems to have a great time with the host Ranveer they danced on many Bollywood songs and Punjabi dance numbers including "Malharia, "Dil Dhaddakne Do", "Subha Hone Na De", "Mundian To Bach Ke", "Khalibali", "Ainvayi Ainvayi" among many others.